First published in the summer of 2000, Born With A Twisted Leg continues to generate over 300 emails every year from fanciers around the word who have experienced the birth of a kitten born with one or more malformed legs. 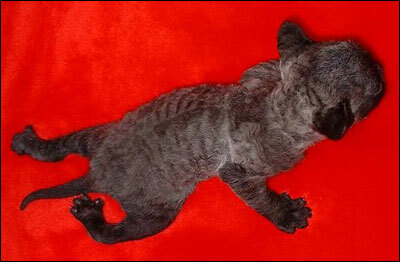 Originally published as a Members Only article, the PandEcats/ShowCatsOnline board felt that in order to save the lives of kittens with this temporary birth condition from being euthanized unnecessarily, we would make the article Update On Kittens Born With Twisted Legs a free access article and available to everyone on the internet. The article included photo essays of three different kittens from three different breeders. Each kitten was a different breed. Each kitten was born with legs twisted to different degrees - from a minor condition of curled paws to a baby with both hindlegs deformed severely. Each kitten grew into a perfectly normal cat following just a small amount of physical therapy! Further research into the condition revealed that most kittens born with legs twisted due to shortened tendons will correct themselves by 7-8 weeks of age with minimal help. 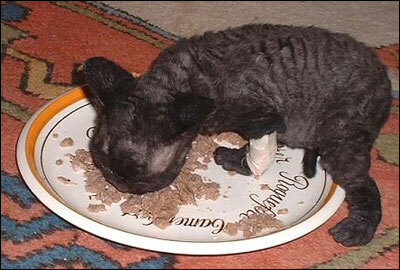 Applying warm compresses and performing gentle stretching exercises on the kitten's legs was all they needed! Sadly, most cat breeders and many veterinarians are unfamiliar with the cause and prognosis for newborns with twisted legs. Assuming the condition to be a hereditary defect, veterinarians often recommend euthanasia. When the original article was published, I could not have predicted the impact it would have. I never suspected just how common it was for kittens to be born with twisted legs. I certainly had no idea of the number of kittens who had been needlessly euthanized because of the problem. However, since the article was first published almost four years ago, word has spread. I now routinely receive over 400 emails a year from people all over the world - cat breeders, cat rescuers, people caring for feral cat colonies, farmers with barn cats and even veterinarians - each thanking me for writing the article and telling me their personal experiences with a kitten born with twisted legs. Karin Weuts of Milaya Devon Rex was such a person. Karin has a small breeding program in Antwerp, Belgium. In early March, 2004, Karin had a litter of two Devons born - including a female kitten born with severely twisted hind legs. In the photo above, the twisting of the hind legs is clearly evident. As soon as she noticed the legs on her newborn kitten, Karin took her to several different vets in Belgium hoping to find an answer to what she should do. She was repeatedly told, "There is nothing that could be done about it - just put it to sleep". Not satisfied, Karin continued looking for options to help her baby. She searched on the internet and found the PandEcats.com article, Born With A Twisted Leg. Karin then contacted me by email and we discussed treatment options. Following the recommendations in the article, she performed massage and "mini stretching exercises" diligently three times a day. The legs became more and more flexible, assuming a more normal position, but at three weeks old the kitten was still crawling on her knees. Karin was understandably very concerned. Once again she contacted me. Occasionally, a twisted leg may be so weak, that it fails to correct without more help than massage and stretching exercises. 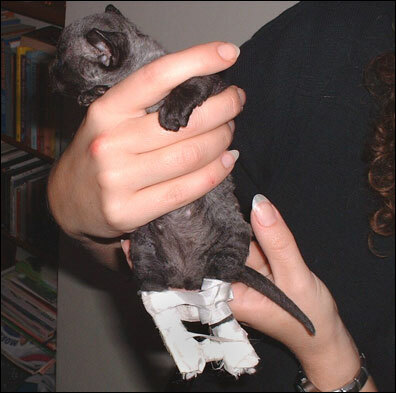 This is more often the case with twisted front legs as described in the article titled, Contracted Tendons of the Front Legs of a Newborn Kitten.In this case, the front legs of the Oriental kitten described in the article needed to be braced. I suggested that Karen's Devon baby was in need of hind leg braces. Karin contacted a Veterinarian-Orthopedist. The specialist showed Karin how to make mini braces for the kitten that kept the hips in the right position and "turned" the legs in the right direction at the same time. Both hind legs were braced and taped individually to help them straighten. The legs were then cross-braced together to hold them in the correct position in relation to the hips. the kitten was walking on all four feet for the first time! Day by day the kitten became stronger on her hind legs! The kitten, now named Lotus, was soon romping on the furniture just like any other kitten! Karin is confident that the kitten will grow up perfectly fine! It's another happy ending to what could have been a tragic story! 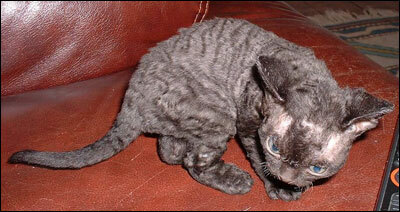 Bravo to Karin Weuts of Milaya Devon Rex and the orthopedist who refused to give up on this little Devon baby! 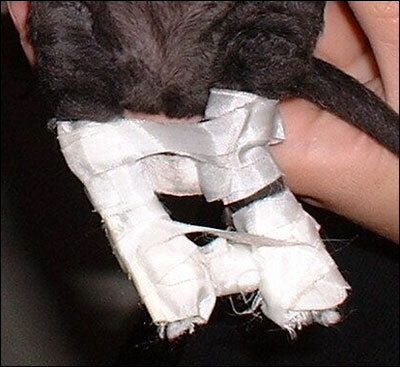 The veterinarian-orthopedist, Geert Verhoeven, checked with his colleagues and was very surprised and sad to hear that indeed most of them did not know how to treat a kitten born with twisted legs. He decided to try and do something about that. He invited Karin and Lotus back into his clinic and took a lot of pictures of how Lotus is now and how to apply the bandages/braces. He is going to write a medical article about it and publish it in an English Veterinary magazine that is read by most veterinarians. Hopefully that will inform more veterinarians around the world about the condition - and more twisted leg kittens will be helped! I think we can speak for most cat lovers when we say "Thank you Dr. Verhoeven!"